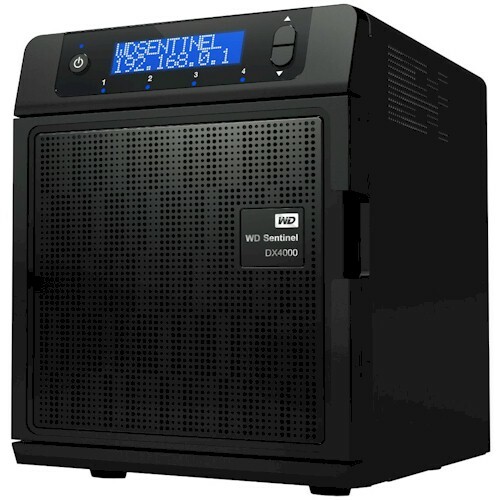 To date, WD has made its name in the NAS world via its inexpensive My Book single and dual-drive NASes. There is also the unimpressive and dated four-drive ShareSpace, which I would think WD would have retired by now. When it decided to get serious about a NAS aimed at small and very small businesses, WD decided to turn to Microsoft for its OS. So it based the DX4000 "Sentinel" on Windows Storage Server 2008 R2 Essentials. For those unfamiliar with this beastie, you can think of it as sort of Windows Home Server with its big-boy pants on. I'm going to let Craig Ellison do a detailed feature review on the DX4000, so that's all I'm going to say about its features for now. The DX4000 comes dressed for business with a black chassis that's mostly metal except for some plastic cover trim parts. The four bays hold 3.5" SATA drives using a neat trayless design. However, WD didn't provide a lock for either the outer drive bay door or the drives themselves. The front panel view with callouts shows the LCD status panel, drive lights and buttons. Notable on the rear view below are dual power ports for redundant power (just add another external power brick), dual Gigabit Ethernet ports and two USB 3.0 ports. Once NASes get into this class, I like them to have audible alerts. But WD decided the DX4000 could do without it. Removing the metal cover reveals the top-mounted main board, which is easy to get to. Replacement of the single fan isn't so easy and requires removing the board. The DX4000 is powered by an 1.8 GHz Intel D525 Atom with 2 GB of DDR3 RAM. This puts it in the same hardware class as Iomega's px6-300d and Thecus' N4200PRO. I was able to take the photo of the board below by undoing the screws and flipping the board over without having to remove the fan or front panel cable. I found two Intel WG82574L Gigabit Ethernet controllers that WD has configured into a failover configuration. They said that aggregation isn't supported. But I didn't see any reason why you couldn't configure them that way by Remote Desktopping in and having at it. And while you are there, you could switch to 4K or 9K jumbo frames if you think that will buy you any additional performance (not likely). Other key components are an NEC 720200A USB 3.0 Host Controller for the two rear panel ports, and a Nutovon NCT6776F Super I/O. I couldn't find any flash and, as previously noted, there is no audible signaling device. I was able to see, courtesy of the Windows Device Manager, that the DX4000 uses an Intel 82801IR (ICH9R) Southbridge companion to the D525 Atom. Power consumption measured 38 W with the drives spun up. There is no power save mode. Fan noise was low when the system was running, but the head noise from the enterprise grade drives was definitely audible in my quiet home office setting. For some inexplicable reason, the fan runs full blast when you shut the system off! The only way to stop this is to unplug the system. I guess WD figures that you'll never want to shut the DX4000 off. The fan also runs full blast during initial setup until the system is finally ready for business. The 8 TB model I received for review (WDBLGT0080KBK) had four 2 TB enterprise-grade WD RE4-GP (WD2002FYPS) drives installed and configured into a a RAID 5 array, partitioned into System (C:) and Data (D:) drives. If you get a 4 TB model, it comes with two drives in RAID 1. But when you add a third drive, WD has worked with Intel to add a bit of NAS magic to automatically migrate to RAID 5. As noted earlier, I'm going to leave it to Craig Ellison to do a feature review of the DX4000. Aside from the RAID level migration trick mentioned above, if you know what Windows Storage Server 2008 R2 Essentials can do, you pretty much know the DX4000's features.